I visited this area in March 2018. 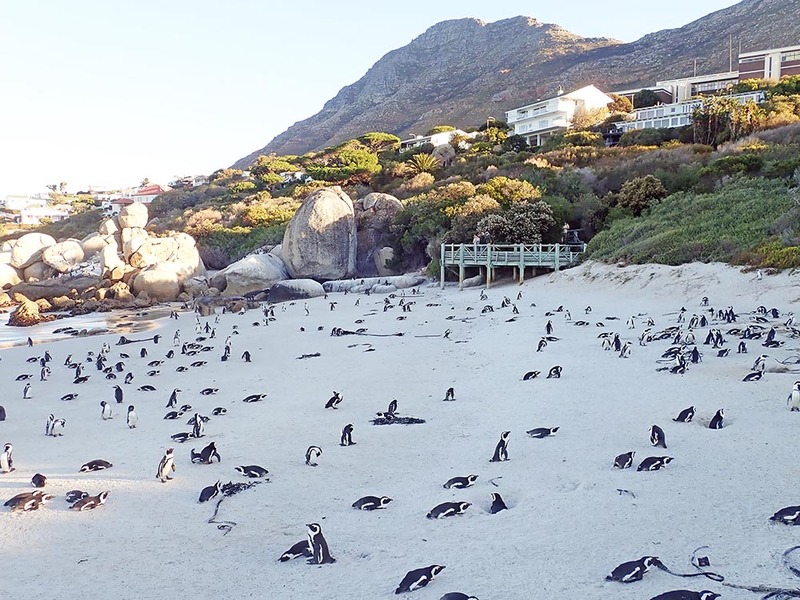 The Boulders is a beach area that is probably the most accessible, closest (and cheapest) a person can get to a penguin. If you have ever fantasised about swimming with a penguin, this is the place to do it! 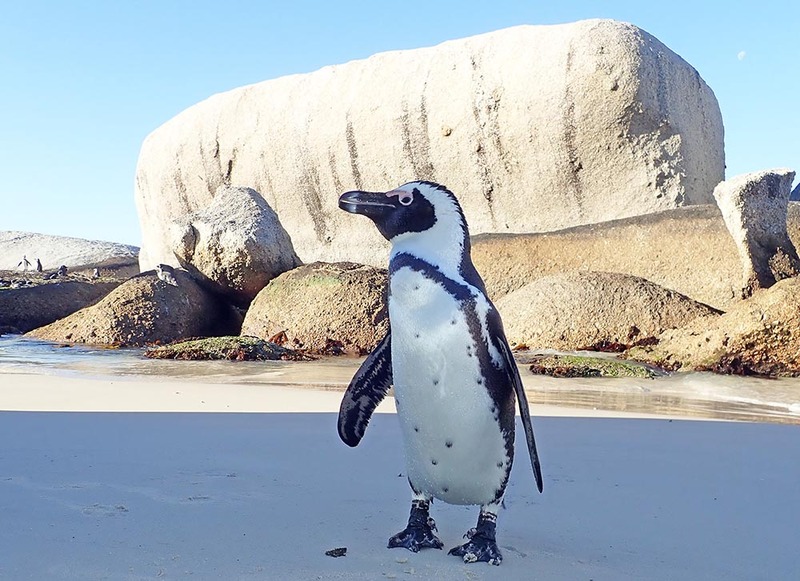 The species to be seen here is the African Penguin. This is one of the ‘Jackass penguins’, a genus that includes two other very similar looking penguins along the coast of South America. They must be the most habituated penguins in the world, as visitors wander around, often putting their cameras right in the penguins face. They do snap and bite. You can get whatever angle or shot you like, including penguins against rocky or a people backdrop, as well as them swimming or coming out of the water. Since you are so close, and they are so used to humans, you can observe plenty of behaviour, including young penguins and their parents. It is probably best to visit in the morning or the afternoon, as there are penguins coming or going from their feeding. the widespread Kelp Gull, often considered a separate species here, called the 'Cape Gull'. This is Africa; there are always mammals! There are signs warning about the ubiquitous baboons, but I did not see any. 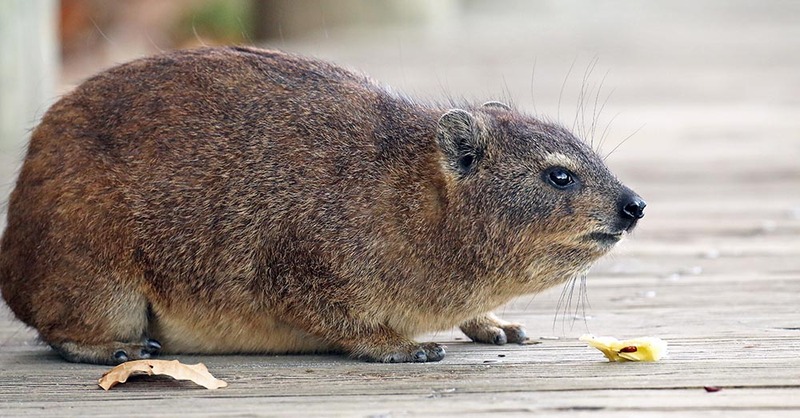 However, there are also many Hyrax (‘Dassie’) in the area. They are often seen scurrying into the vegetation around the sand dunes, or even coming out and scavenging on the boardwalks, and sometimes even in the the trees munching on leaves. Entry is about U$8, and allows access to small nice beaches surrounded by large sandstone boulders. There are always lots of people here, but they can be avoided. The beach is located in Simons Town, about a 40 minute drive from Cape Town. This can be accessed privately by hire car, or many tours come here. There are several cafes in the area. The beach closes at night to allow the penguins some well-deserved rest. If you want to stay in the area overnight, I can recommend Avian Leisure, with their bird friendly gardens.